Hi all. As I continue to rebuild my system, I have here two consoles to review. First up is the Yamaha TF1, in the TF series of compact consoles. The TF1 is the smallest in the TF series of consoles from Yamaha. It provides up to 40 mix channels (32 standard, two stereo, two return), 20 buses (8 mono and 6 stereo, mono buses can also be paired into four stereo buses), stereo and dedicated subwoofer output buses, and 8 DCAs. On board, it provides 16 mic/line inputs on XLR/TRS combo inputs, 2 stereo on RCA, stereo audio in over USB, 16 outputs on XLR, and 34-track multichannel I/O over USB to compatible systems. It also has one expansion card slot that will take newer NY-series (NOT MY) cards. There are 8 on-board effects processors. On the TF1, the first two are stereo effects and have dedicated edit, solo, return, and mute controls accessible from the front panel. The others are assigned by default to the stereo AUX buses for signal processing there, but can be assigned as additional effects by dedicating return channels to them. There are "Flex12" 31-band GEQs on the first eight AUX buses plus the stereo output, in addition to four-band parametrics on just about every input and output. The first eight channels can be assigned to a Dugan automixer in one or more groups. Each channel strip has a color bar and digital scribble strip that will display channel name and a few other parameters, a signal meter, plus the standard mute, cue, and select buttons. The front panel access to the two stereo inputs provides a rotary level control with LED ring level indicator, mute and solo controls, and one has a USB input intended for iOS devices (I couldn't get it to work with my Android phone, but others may have better luck). The main screen is fully multi-touch capable, and readily understands pinch, drag, swipe, and other control gestures. 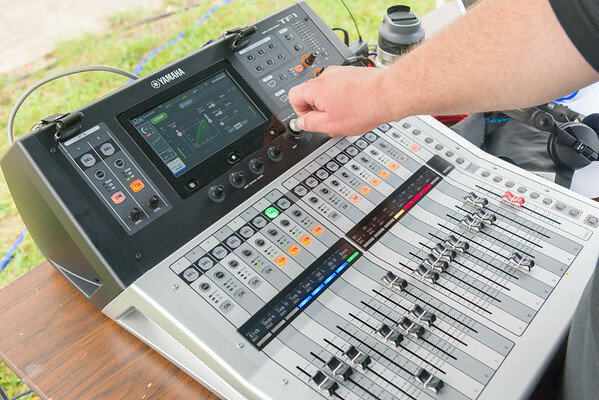 There is one dedicated touch-and-turn knob for parameter adjustment, four assignable rotary controls, and sends-on-faders buttons along the right hand side of the console for every bus. The layer control buttons provide immediate access to channels 1-16, 17-32, all outputs, all groups (DCAs), and a custom layer. There are also two global mute buttons at the top right of the console, one that mutes all FX and one that mutes all inputs. 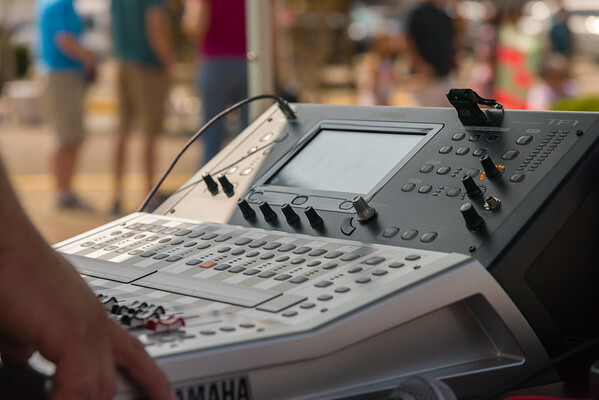 Yamaha provides a full-featured offline/online editor application, a tablet app for remote mixer control over ethernet (user provies access point, etc. ), and a phone app for performer control of monitor mixes (if desired). For my use case, I intended to use a digital snake >95% of the time, so I fitted the NY-64 Dante card in the expansion slot, which provides up to 64 channels of input and output over CAT5e. I also purchased a TiO-1608 I/O rack, which includes 16 inputs with XLR/TRS combo jacks and recallable preamps, and 8 outputs on XLR. This serves as my stage box for the snake over Dante. My use case for this board was for smaller events, places where I might not want to walk in with a $15k console, and some events I do where I'm training high school or other inexperienced operators and need a simple workflow where it is a little harder to get lost. For larger events where I'm running my CL1, the TF1 can provide additional inputs sent via direct out over Dante, or submixed and output as submixes over Dante. This console provides a ton of first-time user "helpful" features. I disable and/or don't use any of them. These include a gain finder that is intended to help one set an ideal gain level (not a bad implementation--it's basically a simplified signal meter that aims to get the user to a good gain state without much hassle), input libraries for various mics and other gear in different scenarios, "one knob" EQ, "one knob" compressor, "one knob" gate, and a few other bits and baubles. The "one knob" things are maybe useful for users who are not familiar with dynamics processors. I don't get the one knob EQ thing and think it's a little silly. The board has good EQ on board, and it's so easy to experiment with it, I'm not sure why anyone would want to try to use a single knob for control. During setup, I chose to handle my own Dante patch using Dante Controller on my computer. Once the patch is set, the computer isn't needed anymore, but it's a good idea to have it handy in case anything loses its mind. The board has "easy setup" for TiO units over Dante that will attempt to configure things in an automatic way that makes sense. I didn't like the way it thought I should think, though, so I went with the more manual patch in Dante Controller. It was easy and too all of about ten minutes to set up, if that. 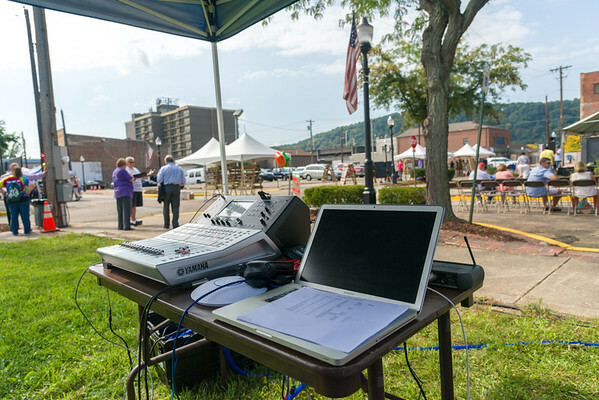 My first event with this console was a small outdoor music festival back in September. We ran 16 inputs from the stage over Dante, some wireless gear into the local inputs back at the FoH tent, break music over a stereo input from a phone, five monitor mixes, stereo mains, and subwoofer output all over Dante to the stage box, where they were patched into the amp rack and powered monitor cabinets on stage. Other than some initial power problems, this system was rock solid from the moment we turned it on. The biggest issues we encountered were physical patch mis-matches. I had the cabling for it, but we ran daisy-chain instead of redundant on the Dante network. Why? I had tested the daisy-chain config, and hadn't tested the redundant config. With time being short after we got power for this event, I didn't want to play and left it as-is. No problems all day long, as expected. I used the TF editor to program scenes for the show before we arrived. I created a simple scene for each band that made use of DCAs on the custom bank, plus DCA roll-out to the other eight strips I had available in the custom bank. This allowed me the flexibility of grouping and reassigning channels I needed for each of the four bands and inter-band talking heads, while still having quick access to the contents of those DCAs for changes during the show. Almost everything was set recall safe, except for channel names, DCA names, and DCA assignments. That way, a scene would really recall just names, colors, DCA assignments, and DCA names. For this event, that was all I really wanted. Each band sound checked after their setup, and only one could set up at a time, so I didn't have a need to store EQ for each group. - Patching is not all that flexible without Dante Controller to handle the Dante patch. The first sixteen inputs can be on-board input, USB input, or Dante "slot" input. Input channel #1 can only be on-board #1, or USB #1, or Dante Slot #1. So, for instance, I couldn't assign on-board input #8 to channel #2. Dante Controller does allow one to patch Dante Slot #1 to have input #14 from the TiO attached to it, but that's not something one would want to be changing on a regular basis during a show. - The custom layer is not stored with scenes. It is stored on the console. This is not like the CL and QL series, where custom layers can change per scene. This isn't a problem with some advanced planning, and taking advantage of the DCA roll-out feature really helps. - The "record 2-channel direct to USB" needs to have a high-speed USB device on the other side, preferrably a hard drive. I tried with a regular USB stick just to see how it worked. The console didn't complain, but it wrote choppy audio that was basically useless. - I wish that the GEQs on AUX buses could be switched to PEQs, like one can do on the CL and QL consoles. Each output does have a four-band PEQ, though it would be nice to have a few more for monitors. I didn't have time to ring out my monitors as well as I would have liked before we had to get started with the first group. As a result, while sound checking the first group, I caught some feedback when someone moved a monitor unexpectedly. Oops. The EQ is pretty slick, with the ability to adjust with the standard touch-and-turn type knob adjustments, or drag and pinch/expand. The drag operation made EQ pretty quick, but it makes some pretty broad strokes. I'd use it to get a quick EQ and then use the touch-and-turn to get a finer take on it. The EQ, dynamics, and effects sound good. Actually, the whole board sounds good. I had an 01V96 for several years in the early 2000's. It sounded OK. It had artifacts, but I knew what they were and could work with them. This is a whole new beast, and it sounds great. Small adjustments are easily discernable. Effects and dynamics respond like they should. Effects are modeled well. Build quality is pretty high. Metal case, faders and knobs feel pretty good. Buttons have a satisfying click to them. All controls have a positive response to them, which is something Yamaha has seemingly always been good at doing. Overall, this being the first time out with the console, things went quite well. There were a few things I would have done differently if I had a second shot at this show, but those have come after some experience mixing a few things on the board. I probably would have skipped the DCAs for most channels on this show, and used a custom layer with all the standad channels with names set per scene, plus a DCA for the drums. Photo credits to my Dad. Thanks, awesome Dad. Jonathan congrats on the new rig! Question for you does the tf1 apply a global delay for effects? Ie if you stack a lot of fx on a channel and it adds a handful of ms does it apply that globally? It is one of my dislikes about my x32 rack, which has peaked my interest in the tf1 rack. Hi Loren. As far as I'm aware, none of the lower level digital consoles perform global time alignment. Next-tier consoles start to add it, like the Midas Pro (1, 2, etc.). Upper-tier consoles do the same thing but go about it in slightly different ways, though they can afford to do that when operating with sub-millisecond system latencies. In practice, if I get into doubling channels or something where the artifacts from that would show up, I'm probably not using my TF anyway. I could be wrong, but I've not heard of any boards in the lower price range offering global delay compensation. Well it was an optimistic question! Although it is amazing what is available for a couple grand now a days, I am hopeful with the way things are trickling down that lower latency, better pre's and global delays are within in the mere mortal's budget in a few years. Hi Loren and welcome to the forums. Your'e about to get my "pre amp" rant. If there is something you don't like about the way a console sounds, how do you KNOW it's the mic pre? How do you separate the ANALOG preamp function from any supporting analog circuitry or the imbedded (on the chip) AD converter and how do you separate the resulting digital signal from the digital processing in the console? There are fewer than a dozen mic preamp chips - likely fewer than a half-dozen - and almost every console uses one of them regardless of the console brand. If you find a console you hate and an console you like, that use the same mic pre chip, how do you account for the differences? Mic preamps are mature technology and until you get into preamps that deliberately color the sound (and some people like that sort of thing), they're largely interchangeable within the price points of the chips. Yamaha produces their own pre amps and DSP chips and Behringer is producing their own input silicon for Midas, but other than those the mic preamp chips are off-the-shelf products.